New librarian Ella Stocker clearly remembers using the ARHS library often when she attended ARHS, to do copious amounts of research for her social studies classes. She also remembers being distracted while working in the library, because there were so many other things going on, but she was always simultaneously engaged. “That’s why being a librarian is so great; I’m professionally curious,” she said. “The timing was serendipitous,” said Ms. Stocker, describing that she heard about the job opening at ARHS right when she was looking for a job. “It’s been really nice to be back [at ARHS],” she added. Before she became a librarian, Ms. Stocker was the house manager for the Guthrie Theater in Minneapolis, and wrote for other theater companies in the Minneapolis area. In 2014, she moved back to the East Coast and applied to library school. While studying, she worked at the Boston Architectural College Library and the Goodwin Memorial Library, in Hadley, Mass., so she had experience as a librarian outside of a high school environment. Before working here, Ms. Stocker also worked as a student teacher at Wildwood. 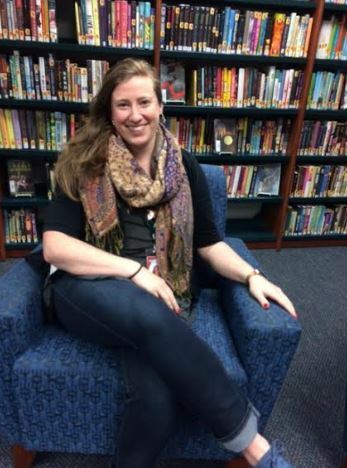 One of Ms. Stocker’s long term goals in this position was to use the library to create a culture of reading outside of school for ARHS students. One challenge Ms. Stocker anticipates is that unlike elementary school librarians, high school librarians don’t get to see every student every week, so she may not get to know students as well. She is more generally a fan of the arts, performing and visual, and she frequents concerts and plays. “We’re lucky to live somewhere where there’s so much good art going on,” she said, in addition to the amazing art within ARHS. The one word Ms. Stocker would use to describe herself is thoughtful. In terms of this being a positive or negative trait, it “goes both ways,” she said. “Sometimes I spend too much time thinking and not enough time acting,” but it also means she’s very careful about others’ feelings, since she thinks about how her actions will affect others before she carries them out. In literary terms, Ms. Stocker relates most to Jane Austen heroines. “If you balled them all into one, that would be my personality,” she said. Ms. Stocker believes strongly in fostering and preserving joy. “It’s really important to align your life in a way that produces more joy, not just for yourself but for other people,” she said. This value of creating joy connects to many other values she holds, like inclusivity. Some of the people that have influenced Ms. Stocker and helped her form this and other core beliefs are her family and her friends. “I come from a very big, loving family,” she said, explaining that she’s especially close to her brother and her parents. She was a fan of the Beach Boys growing up, and to this day, whenever Brian Wilson, “the creative genius behind a lot of The Beach Boys music,” performs, she and her dad try to go see him together. “It’s become a thing that my dad and I have really bonded over,” she said. She’s also grateful for her wonderful group of friends, both from her time at high school here and her time in Minnesota. The teacher would always say “nice isn’t a good enough adjective,” and “asked us to put words to something, not just boil things down into one adjective,” Ms. Stocker said. She tries to integrate this into her life whenever possible, and finds it especially helpful when giving feedback to others, especially in a school environment. One way librarians are able to give students feedback of a sort is through book recommendations. If Ms. Stocker could convince everyone at ARHS to read one book, she would choose Markus Zusak’s The Book Thief. Ms. Stocker doesn’t think that “giv[ing] it all up to make the world a better place” is the only way to change the world, albeit inspiring. She thinks we can all do our part to make a positive mark on the world, and she is thrilled to do so as our school librarian.